Winter storm Remus provided spectacular documentation of the approaching weather system, but didn’t amount to sufficient accumulation to cover the pile in snow. So, the wait for the next storm begins. 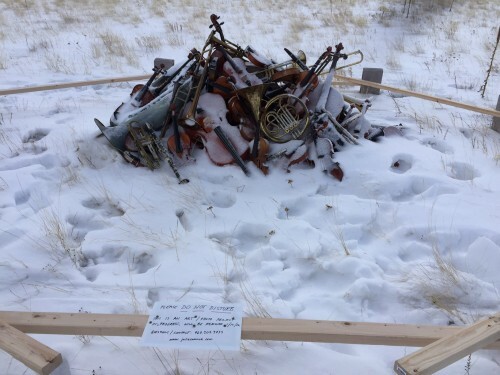 To dismantle the instruments would mean starting over, so I was left with the decision to cover the pile with a tarp and risk disrupting the form, or leave it exposed and risk damage by passers-by (the site is remote, but occasional traffic passes along the forest road). I opted for the latter, leaving it uncovered and fenced in with 2x4s and cinder blocks. Periodically checking on the instruments over the next several days revealed tire tracks and footprints right up to the pile. I was nervous that people had come so close to the instruments in my absence, but reassured (and surprised, really) that the instruments had not been touched or altered. As the landscape becomes less distinct with the falling snow reducing visibility, so will the imagery sequentially diminish in clarity, obliterating the recognizable landscape and instrument forms. Accordingly, the series of nine large-scale oil paintings will transition from representational imagery to non-objective color-field abstraction; and as the storm subsides, the series will return to clarity and realism, revealing the snow-covered pile of instruments. The accompanying video will document segments of the event, revealing glimpses of the instruments between periods of whiteout conditions. So, I feel some apprehension that perhaps someone driving by will post a photo on social media, and the idea will be publicly revealed in its immature state. On the other hand, I’m touched that the pile has been visited several times, and so far, respected.